The education of our children is a shared responsibility which involves the home, school, parish and community. 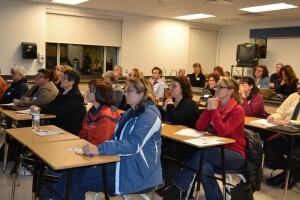 It is always beneficial when parents are full participants in the education of their children. One of the most effective ways for parents to be involved is to join their Catholic School Council. The Parent Involvement Committee, a subsidiary of the Catholic Education Coalition, was established to help support and encourage parents to become active members of the Catholic school community. Each Year, the Parent Involvement Committee hosts a parent summit which offers interesting information sessions to parents and other members of the Catholic school community, on topics such as internet safety, early learning, and childhood anxiety.